Make the most of your existing collection of Canon EF/EF-S-mount glass with this Vello Lens Adapter that will allow you to mount these lenses to a Micro Four Thirds camera. Precise construction makes it easy to attach these adapted lenses to your camera and keeps it secure during use. Infinity focus is guaranteed, ensuring that you get proper functionality our of all your optics. Additionally, the adapter is made from a durable zinc alloy and features a matte black finish on the inside to reduce the potential for glare and reflections that can negatively impact image quality. This adapter enables the use of Canon EF/EF-S lenses on Micro Four Thirds cameras, meaning you can now use your existing stable of lenses on your current camera. It is also very secure, holding the lens in place without any wobble sometimes associated with the adapting process. Box Dimensions (LxWxH) 4.2 x 3.0 x 1.7"
Canon EF/EF-S Lens to Micro Four Thirds Camera Lens Adapter is rated 3.6 out of 5 by 48. Rated 1 out of 5 by CK from Does not fit Canon EF lenses LA-MFT-CEF does NOT secure to Canon EF lenses. The adapter lines up nicely, but will not turn and lock into place. The copper pieces inside the adapter catch on the lens mount and prevent it from fully turning into a locked position. I tried it on my 50 1.4, 24-105 and 70-200 with no success. This product does NOT secure to the Canon EF lenses. I will be returning mine for not being as described. Rated 5 out of 5 by willyb311 from Inexpensive but does the job well! I use this adapter to connect my cinema lenses with Canon EF mount to my mft bmpcc. The cinema lenses all have manual focus and aperture rings so this adapter was a great purchase since I had no need for electronic connection to my lenses. It seems sturdy enough and it fits snugly and securely with my canon and Rokinon lenses as well as with the bmpcc. Of course, there is the issue of sensor crop, which this adapter does nothing for, but its better than not being able to use any of this expensive glass I have laying around. It does what it is supposed to do and for the price, its well worth the investment! Rated 4 out of 5 by MPLUSM from Quick fix Shooting mainly video on a Panasonic GH4 through a Canon 28-300 L. Does exactly what it needs to, don't expect anything magical, just a coupler for EF lenses to a MFT mount. Goodbye AF, goodbye IS, goodbye aperture, hello $ lens solution. Rated 1 out of 5 by CK from Does NOT fit Canon lenses. 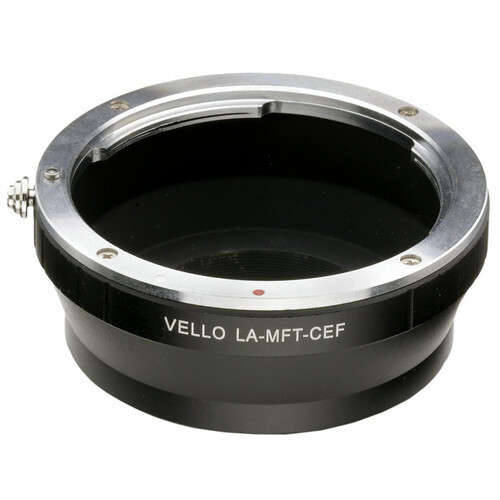 The adapter (LA-MFT-CEF) does NOT work with the Canon lenses. The adapter is the right dimensions and lines up nicely, but does not fully rotate or click to secure the lens into place. I tried three lenses, all with the same non-securing fit. I'm returning the product because it did not perform as described. Tried the 50 1.4,my 24-105, and 70-200. Rated 1 out of 5 by Alex from Faulty Product I bought this to mount my EF lenses to my BMPCC and my canon lenses didn't fit the EF side. I'm not sure they're all like this, but the one I received didn't work. This particular adapter is fully mechanical, so any crop factor is going to be from the lens being used on the GH4. Since Micro Four Thirds cameras have a 2x crop factor, a 100mm lens will effectively act as a 200mm lens. I know I'm slow here ... but if an EF or EF-S lens is attached to a Blackmagic Pocket Cinema Camera via this adapter, there will not be any way to control the aperture. Am I understanding this correctly? Thanks! Yes, this is correct - there is no communication between the lens and camera body, and you will have to set your exposures manually. Will this adapter work on Olympus OMD cameras? So with this adaptor I would be able to connect not just canon lenses, but any lens that has an EF/EF-S Mount onto my GH4? Besides it having no communication with the camera, and no aperture ring, why is this product so cheap? This is correct- any EF/EF-S lens can be used with this adapter. The fabrication cost of this adapter is very low, and the manufacturer is able to offer this product at a very reasonable price to reflect this and make an affordable product for consumers wishing to use this type of adapter. - Does this produce any VIGNETTING (like the Vello adapter version with &quot;Aperture control&quot; ring) when using Full Frame Canon Lenses on Panasonic M4/3 camera? - Does it increase the Full Frame to M4/3 CROP Factor (which is calculated as 2x)? Thank you! Will this work with the modern 'focus by wire' system in the new ef-s lenses focus ring? How does it work if they have to be powered thru the connections? I just need manual focus but this seems impossible. NO, if you use lenses that have AF/MF &quot;by wire&quot; (meaning they need to be powered to actually move focus elements), like the Canon &quot;STM&quot; Lenses, then you will NOT be able to focus. However if you use lot of other lenses (Canon L and non-L versions) that have a Manual Focus ring which doesn't focus &quot;by wire&quot; you will have no problems at all to focus. It all depends on the Lens you mount on it. In fact there are LOT MORE lenses with Real Manual Focus Ring than &quot;Focus by wire&quot;. can lenses without an aperture ring work? If so, how is the aperture set?